Payload preparations for the second Vega launch from French Guiana have commenced, with this upcoming mission’s two primary satellite passengers – VNREDSat-1 and Proba-V – now undergoing their initial checkout at the Spaceport. Vega is the lightweight member of Arianespace’s launcher family, which joins its medium-lift Soyuz and heavyweight Ariane 5 vehicles. These pre-launch activities kicked off this month, following arrival of the two spacecraft in French Guiana. Preparations for VNREDSat-1 began inside the Spaceport’s S5A building, while Proba-V was based at the S1B clean room facility. In the photo at left, Proba-V undergoes its checkout inside the S1B clean room. 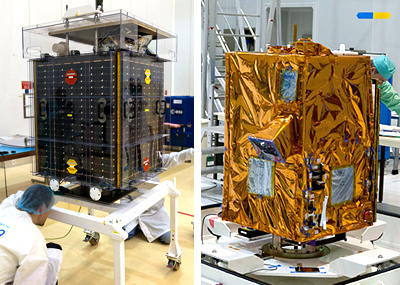 At right is VNREDSat-1, which began its processing in the S5A integration hall of the Spaceport’s S5 payload preparation building. The VNREDSat-1 co-passenger on Vega will have a mass of approximately 120 kg. at liftoff. It was built by Astrium on behalf of the Vietnam Academy of Science and Technology (VAST), and will support the Vietnamese government’s initiative to create an infrastructure enabling better studies of climate change effects, improving predictions for natural disasters and optimizing the country’s natural resource management. Proba-V was produced by prime contractor QinetiQ Space Belgium for the European Space Agency and will have an estimated launch mass of 160 kg. Carrying a newer version of the Vegetation imaging instrument previously flown on the Spot series of Earth observation satellites – which also were orbited by Arianespace – Proba-V will monitor global vegetation growth. Estonia’s first satellite, the 1.33-kg. ESTCube-1, will be lofted as well on the upcoming Vega mission. Developed by students from Tartu University, the Estonian Aviation Academy, the Tallinn University of Technology and the University of Life Sciences, this small spacecraft has been evolved in conjunction with the Finnish Meteorological Institute and the German Space Center (DLR). This upcoming mission – planned for April – is designated Flight VV02, and is one of the flights scheduled in the European Space Agency’s VERTA (Vega Research and Technology Accompaniment) program – which aims to demonstrate the Vega launch system’s flexibility as well as its ability to carry multiple satellite passengers.